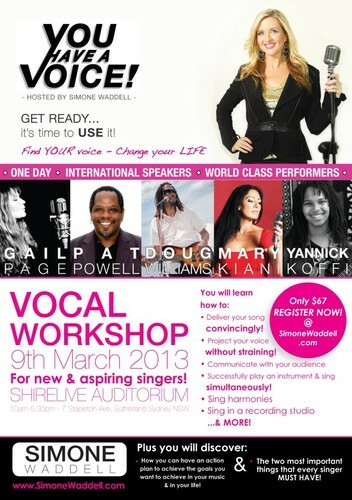 For New and Aspiring Singers! The You Have a Voice conference is the only event of its kind on Australia. An incredible day of fun, informative and inspiring sessions taught by the absolute finest teachers and performers: An unbeatable line up with Mary Kiani, Doug Williams and Gail Page bringing their expertise and featuring stunning world class performances by Pat Powell and Yannick Koffi. Picture being able to spend an entire day with like minded people, who love music and who are creative like you. Picture having the opportunity to sit at the feet and learn from people who have been in the music business as professional singers for years. Singers who have done so many great things it is hard to even fathom! Imagine hearing something that could change the way you think about your life, your voice and your destiny forever. There is also a masterclass for anyone who wants to sing for the panel and be encouraged. Anyone from beginners to professionals will benefit from this life changing day. Don't miss out!